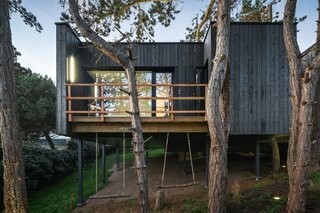 Outfitted with a striking charred wood exterior and blonde wood interior, Atelier Victoria Migliore's Treehouse was constructed without felling a single on-site tree. This 183-square-foot dwelling pairs crisp, white interiors with warm wood accents. Thirteen interior designers sound off about when to splurge and when to save when it comes to the living and dining rooms. Have you ever wanted to live in a Wes Anderson movie (and if so, which one)? These nine modern sofas are every bit as plush and colorful as the auteur’s films. In the village of Oak Park next to Chicago’s West Side, Seven Point fights the stigma surrounding cannabis usage with high-end design. This circa-1880 brownstone in Stuyvesant Heights has been thoroughly renovated for modern-day living.